Black Order from Avengers: Infinity War Revealed! Following yesterday’s reveal of a Thanos maquette from Avengers: Infinity War at D23 Expo, Marvel Studios has pulled back the curtain on four more maquettes from the film revealing none other than Thanos’ Black Order! The characters seen look nearly identical to their comic book counterparts and include Corvus Glaive, Proxima Midnight, Cull Obsidian, and Ebony Maw. 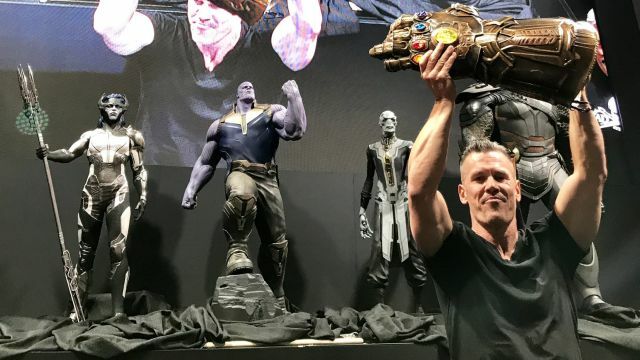 In addition, the Mad Titan himself, Josh Brolin, showed up on the floor with the (fully assembled!) Infinity Gauntlet. Check out the photos in the gallery below! Confirmed cast members for the film so far include Robert Downey Jr., Chris Evans, Mark Ruffalo, Scalett Johansson, Chris Hemsworth, Anthony Mackie, Paul Bettany, Elizabeth Olson, Chadwick Boseman, Sebastian Stan, Don Cheadle, Chris Pratt, Dave Bautista, Zoe Saldana, Pom Klementieff, Benedict Cumberbatch, Benedict Wong, Sean Gunn, Tom Holland, Josh Brolin, and Paul Rudd. The Avengers sequel sees Earth’s Mightiest Heroes teaming up with the Guardians of the Galaxy to take on Brolin’s Thanos.